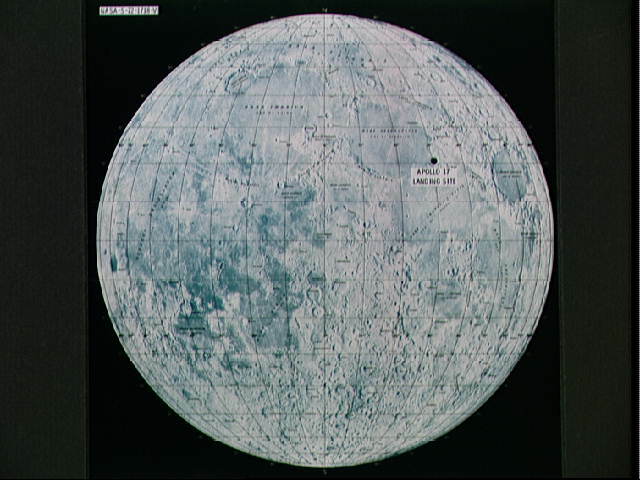 A photographic illustration of a full Moon showing the location of the Apollo 17 landing site on the lunar nearside. The black dot pinpointing the landing site is in the Taurus-Littrow area at the southeastern edge of the Sea of Serenity. The coordinates of the landing point are 30 degrees 44 minutes 38 seconds east longitude and 20 degrees 9 minutes 50 seconds north latitude.